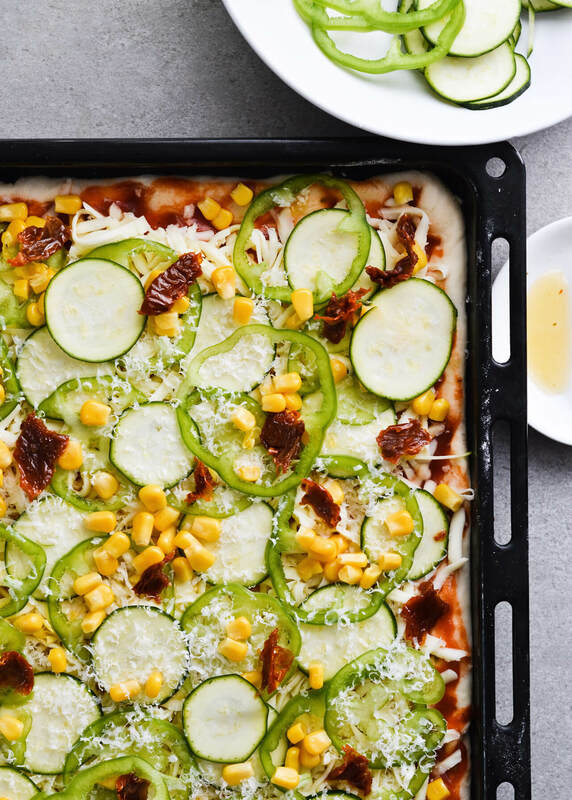 Making pizza as cool as possible with the best vegetable sheet pizza! Please tell me you love pizza, pleeeeease! Because I do. Too much actually. We have it for dinner at least once every 1-2 weeks and we rarely go longer than that without it. It’s really the ultimate weekend dinner. It’s hard for me to point out a favorite, because I love various flavor combinations. 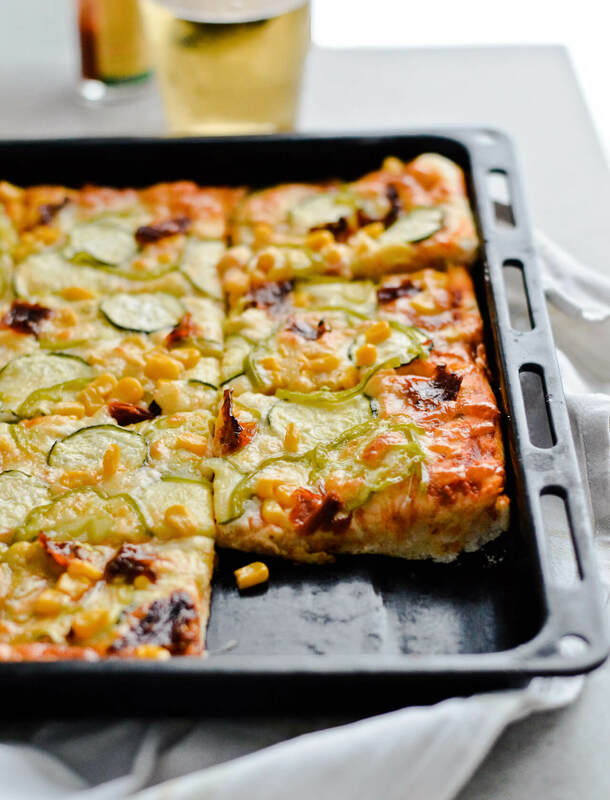 Mushrooms and garlic, pesto with lots of cheese, mozzarella and fresh tomatoes or something like this vegetable pizza. I really do love a good veggie pizza. 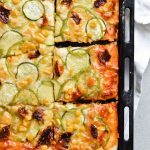 Before I talk about the recipe specifics, do you know that we eat pizza with cutlery here? Knife in one hand, fork in the other. You’re served a whole pizza too, not sliced, unless you specifically ask for that. The only exception are the few pizza stands that sell individual slices. I mean, this is clearly not a big deal, it’s just how we do things here, but I saw this Buzzfeed post and kind of hated it. You know.. don’t come for me and my pizza eating. I take my pizza very seriously. So you do you and I’ll do me. As long as we’re all loving pizza, what’s there to argue about? 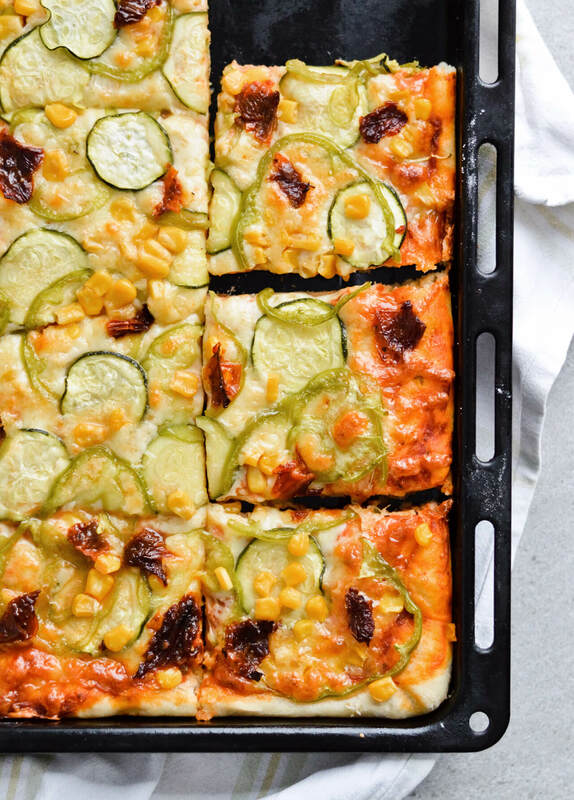 This pizza today however really is the best vegetable sheet pizza though. Because of how it tastes and also because you can serve large slices with a side of cutlery, ha, or small portions and eat it with your hands. Whatever you prefer. I admit I eat it leftover cold pizza with my hands. Now, about the vegetables. 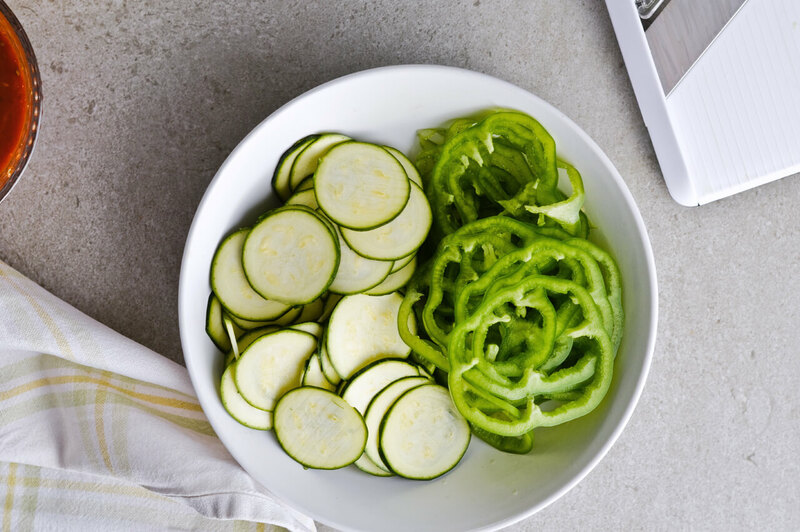 I think anything works, as long as the vegetables are thinly sliced, but I love the combination I’m sharing today the most. 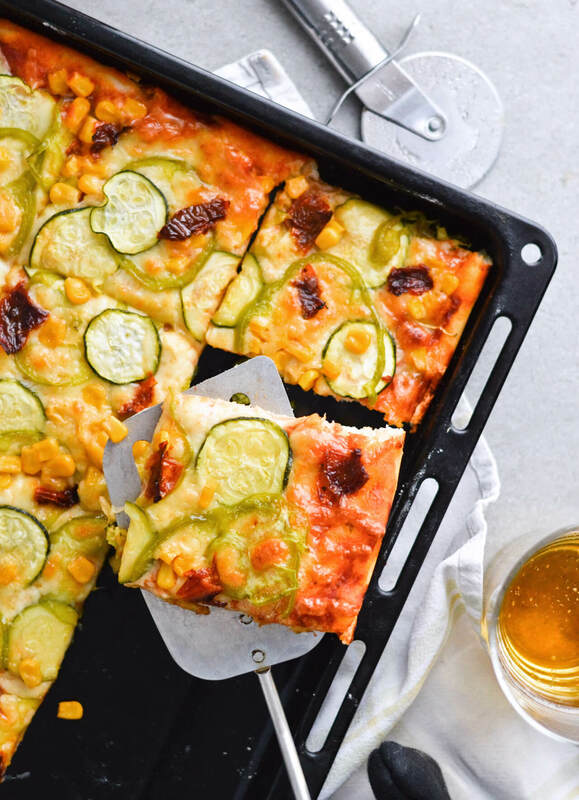 Peppers are insanely aromatic, the zucchini taste amazing on a pizza, the corn adds that bite and sweetness while sun-dried tomatoes are what I call a “meaty component” because they have that meaty vibe, but are just way better. I always make pizza with mozzarella as the main cheese. I used to use other types of cheese, but once you go mozzarella there’s no way back. I do prefer low moisture mozzarella, for the obvious reason that it has less water and won’t get the pizza wet. However, buffalo mozzarella does work in smaller quantities, as long as you let the pizza sit for a few minutes before serving. Because mozzarella is milky, but not salty at all, I like to add a sprinkle of Parmesan all over the pizza. Any other strong cheese works here. 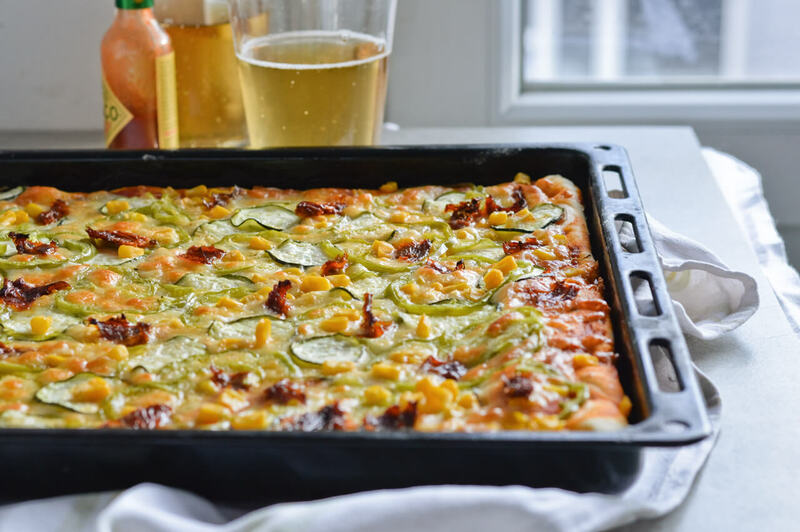 With a pizza like this one, you can try feta too, because it goes well with the vegetables used. And the sauce? You have many options. 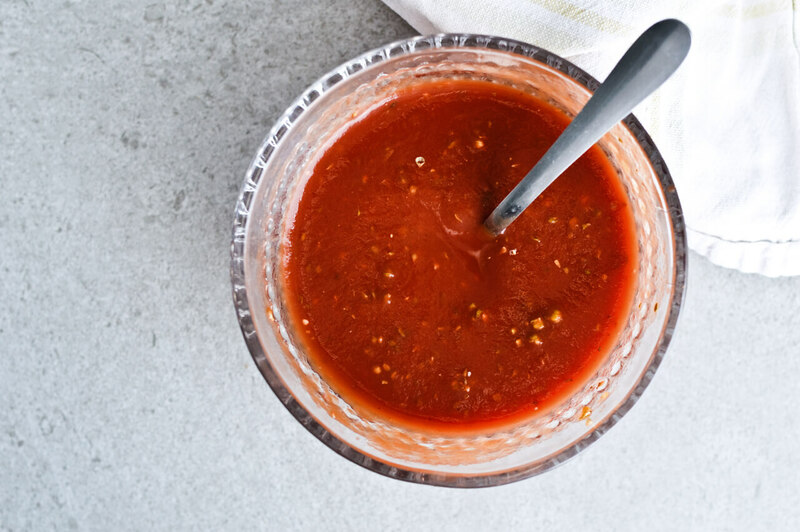 You can make homemade tomato sauce and sprinkle it heavily with oregano, you can use store-bought sauce, which I think is perfectly good or you can make my quick pizza sauce. It’s basically store-bought tomato puree with a few embellishments that makes it taste a lot better. 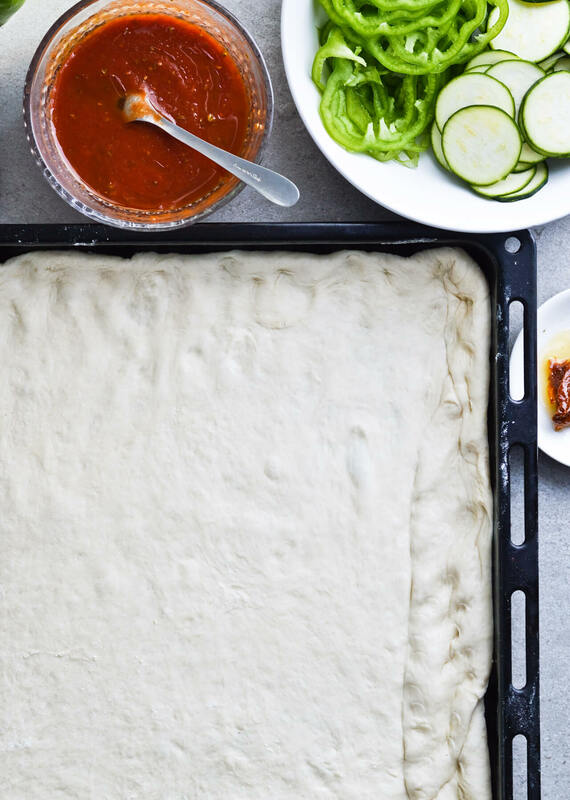 With dough, you could go the store-bought route, but please try making my homemade pizza dough too. I promise it’s worth it and it honestly doesn’t even take that long to make. Think of it as part exercise part therapy after a long day, the kind that ends with an awesome dinner. Doesn’t that sounds great? Makes one 12 x 14-inch pizza. Preheat oven to 200°C (392°F) and grease a 32 x 35-cm | 12 x 14-inch pan (or anything close to that) with 1-2 tablespoons of oil. Make the sauce by combining tomato puree, salt, sugar, oregano and olive oil in a small bowl. Set aside. Once it’s risen, transfer dough to a floured surface. Push it apart with your fingers, forming a rectangle. Once you have the rough shape, you can finish it by rolling it out with a rolling pin. Transfer to the prepared pan, don’t stretch it out too much, simply push it slightly up the sides. Spread sauce all over the dough. You should be able to see the dough through the sauce and you might have some sauce left over. Top with all the mozzarella as evenly as possible. 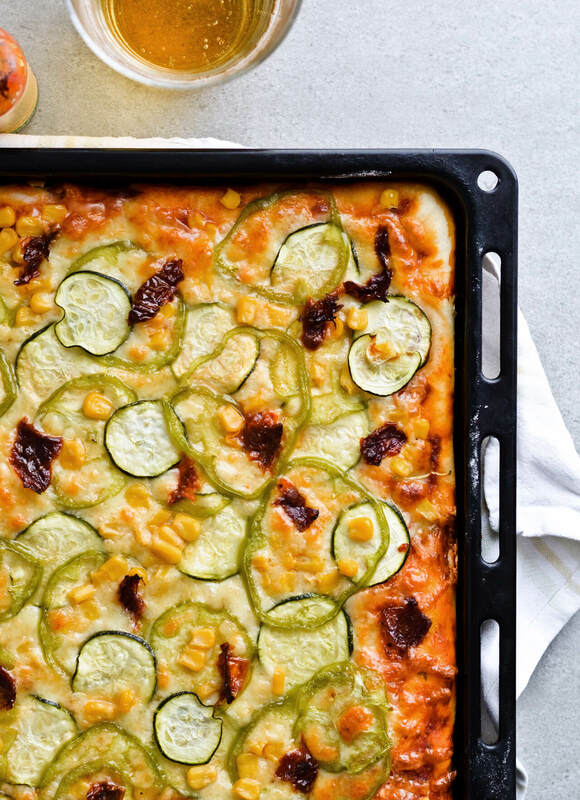 Add sliced zucchini and peppers, sprinkle with corn and sun-dried tomatoes. Lastly, grate some Parmesan all over. Bake in the middle of the oven for about 10-15 minutes, until the cheese is bubbly and the dough puffy with a crust formed. You can tap that crust with a spoon and it should sound hollow, the bottom of the pizza should be crispy too. Remove from oven and let sit for a few minutes, then slice into desired portions and serve. What about the dough, how do I make your dough?